We are always trying to forget, because forgetting means an escape from the dark and ugly truths that come with love and life. The first time I watched 2004's "Eternal Sunshine of the Spotless Mind," which turns 10 years old today, March 19, I was a heartbroken, overly emotional 18-year-old. I couldn't handle the thought that in this fictitious world, as written by Charlie Kaufman, one person could choose to erase another from their memory. It depressed my immature, post-breakup self so much that I turned the film off halfway through. I didn't want to forget, and most important, I couldn't bear being forgotten. Most of the things that we all want when we're in love aren't actually realistic; rather, it becomes a personalized amalgamation of what we see in movies, listen to in songs, read about in novels. Sure, they include fragments of truth, but wild fantasies of the heart and mind are what take flight from the sometimes disappointing and imperfect realities of life. Imperfection, imbalance, miscommunication; these are the parts that make and eventually break Joel and Clementine's relationship in "Eternal Sunshine." Their opposite natures are what draw them together -- she's impulsive, adventurous, and free-spirited, while he's taciturn, untrusting and cautious -- each missing what the other has to offer. Yet if you think about it, we don't really get to know Joel or Clementine all that well at first. Instead, we enter their story near the end, which is an echo of a beginning. There's a familiarity that hangs in the Montauk fog when they pass on the beach, one which, of course, resembles their true first meeting, and one we may recognize from our own times of loneliness. As Joel says, we just wish we could meet someone new. 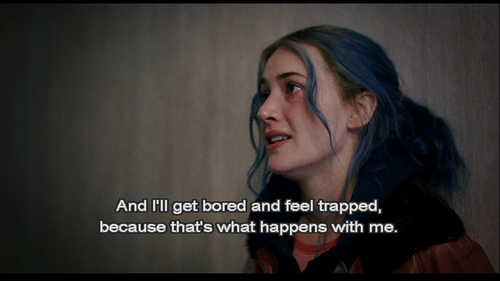 Around the time that I finally watched "Eternal Sunshine" in whole, I also met a girl with a blue streak in her hair. She was wild and impulsive, and she approached me first, of course, because I was the shy, quiet one (or "closed-mouthed" as Clementine calls Joel). We fell in love as quickly as her glitter-shimmered eyelids caught my eye, and it was beautiful, and perfect, and magical. We even watched "Eternal Sunshine" together, and it wasn't until that third (technically second-and-a-half) viewing that I realized how much we both resembled the film. Like Joel and Clem, anyone who's ever been in a relationship knows that once the honeymoon phase ends, we begin to really see our significant other for who they are, as they do us. The least desirable traits come out, the bad habits and hidden secrets break through the mask of who we want the other to see. This is when irritability strikes, when fights commence, when we become uncomfortable and terrified that someone else is watching us shed our skin and sees the layers we're not proud that hide underneath. This, among other things, can lead to the decline of a relationship, and it's so much harder to salvage something when so many pieces have become broken. Yet sometimes the fights and regretful memories are the only way you really get to know someone. The only way we can really get to know Joel and Clementine is through retracing their steps together with them, witnessing their flaws and mistakes erased along the way. This is one of the most beautiful aspects of Kaufman and director Michel Gondry's film, and the most revealing about how to save and rebuild a relationship. "Eternal Sunshine" is one of the greatest love stories ever for the simple fact that it urges us to face our faults and to accept that they're inevitable. Trying to evade hurtful memories or moments of regret only leaves us back where we started. Joel and Clem erased each other completely, but there was something that brought them back to the shores of Montauk. It was stronger than the chemicals of the brain, and trumped the technological inventions of man. Similar to Spike Jonze's "Her," the capacity of love is something that cannot be contained, regulated, or even understood through modern innovations. Zap away memories or try to love within the finite union of man and computer, and you'll find yourself still missing and longing for something. No matter what we try to tell ourselves, or what every other romantic comedy claims, love can become its worst, its ugliest, and its most painful. But once we accept the darkest memories, acknowledge inevitable future mistakes, and cut away the soiled spots to let the beautiful ones shine through, that's when love is transcended. "Eternal Sunshine" is not about forgetting the bad moments, getting over them with a new lover, or making up and pretending they never existed. Kaufman's ingenious love story reminds us that we will hurt, we will disappoint one another, and even if we remain in denial and force ourselves to forget, things are likely to repeat themselves. One of the best moments in "Eternal Sunshine" is the last exchange between Clementine and Joel, where she assures him that he will find flaws in her and that she will get bored and make mistakes. His only response is, "Okay." I recently watched the film again and I absorbed it in a different way than I had the first several times. I was not emotionally opposed to the premise or in the euphoric state of early love; I was watching it after having experienced the darkest and hardest parts of a long relationship. I could, for the first time, understand the pain and frustration of trying to glue all the fallen pieces back together and not knowing how to try to escape the bad memories and regrets -- knowing your deepest layers have been revealed. Nearly two and a half years later, I'm still with the girl with the blue streak (who no longer has colored hair). With her, I experienced that point of accepting each others' mistakes, of learning to grow with them and not run away with our eyes shut and heads turned in ignorance. It's only through this, through simply saying "Okay" to one another, that a seeming end can turn into a new, a better, beginning.